This year’s second and overall forty-second coin from the U.S. Mint’s series of America the Beautiful quarter dollars honors the national park with a scene depicting the sea caves at Devils Island. A mint mark appears on each quarter’s obverse (heads side). It reflects where a quarter is produced with “S” for San Francisco, “P” for Philadelphia, and “D” for Denver. 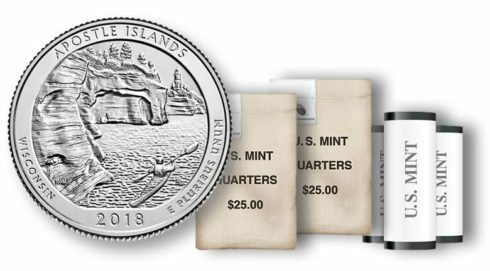 Apostle Islands National Lakeshore quarters from the Denver an Philadelphia Mints will eventually appear in circulation as Federal Reserve Banks distribute new coins to financial institutions. However, those from the San Francisco Mint are produced only for coin collectors. To learn more about the quarter’s design, its official April 11 release ceremony, and a U.S. Mint coin forum held on the evening before the quarter ceremony, visit our information page for the Apostle Islands quarter. Buy quarter rolls and bags directly from the United States Mint. The agency’s page for quarter products is online here.